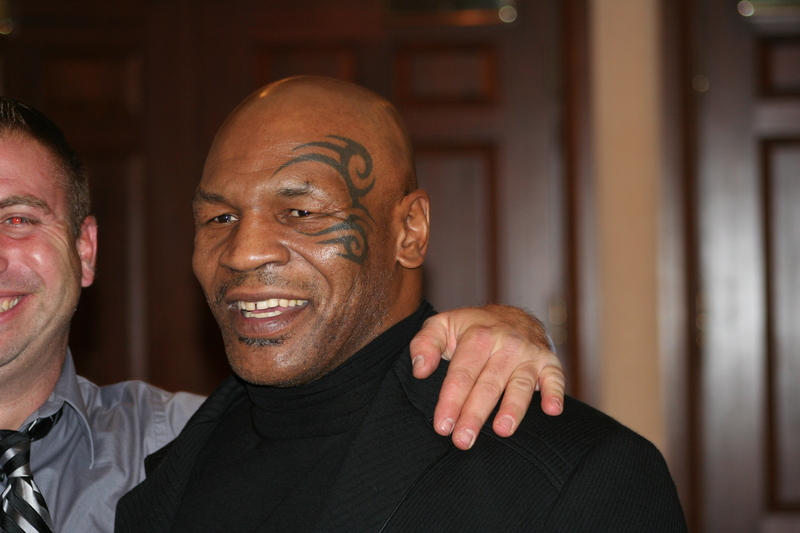 Today my Mike Tyson feature/essay was published in Sports On Earth. When I had the pleasure of interviewing “Iron” Mike two years ago, it was for the sole purpose of writing a chapter on him for my yet to be finished book, The History of New Jersey Boxing by The History Press. So as teaching swamped me, and my wife kept magically producing children, and documents became harder to harder to find, the work is still in progress. Yet I always knew I could put a shorter piece together on my night with Tyson, because I got more from him in an hour than I could have ever imaged. And what a story he told me. For starters, he was an absolute gentleman. He didn’t try to hide when he was bored of one topic or shy of another. He is a tough interview to prepare for, believe it not. Only for the fact that he has been interviewed a billion times, and asked the same questions over and over. What do you ask the most interviewed athlete of our generation? No, that is not me next to Iron Mike. Of course the one picture someone took of us talking didn’t come out. This story went through a few different phases and magazines. This was the right magazine for it. Editorially, I’m very proud of the work Sports On Earth has produced over the past few years, and it is an honor to be a part of the team. Call “Iron” Mike whatever you want. Don’t ever accuse him of not being forthright and honest.